There’s an old joke about a man who’s walking home from work one night to find a fellow on his hands and knees beneath a sidewalk lamppost. ‘Well, why on earth are we searching here then?’ asks the man. To say the world is changing at an unprecedented pace has quickly become one of the platitudes of our time, partly robbing the message of its mind-bending potency. To speak this way has become so de rigueur that business leaders now feel comfortable, perhaps even cool, conversing about exponential curves, blockchain and the 4th Industrial Revolution. But there is nothing comfortable about exponential change. As Peter Diamandis is fond of pointing out, the human brain is still programmed to process linearly, not exponentially, so even thinking in this way requires a fundamental cognitive shift. That would be fine if this were a thought experiment, but as every industry leader now knows, this challenge is very very real. Seemingly overnight, apparently invincible corporate giants are being felled by radical disruptors who move quickly to exploit the opportunities opened up by technological development. Most at risk are the long-established players in industries like banking where traditional mindsets have left leaders ill-equipped to respond to, or more accurately preempt, daily shifts in the landscape. Unsure how to face the unknowable threats in the darkness, many decision makers are hoping policies like digital transformation will be their white knight as they continue to pay attention to the increasingly small pool of familiar light that they understand. But corporate digital transformation does not work this way. It is no longer sufficient to use it as a means to reduce costs and improve efficiency. It can no longer be thought of as a series of technology or digital marketing initiatives. It is a strategic imperative. Digital needs to become part of an organization’s way of being, a fact that Singapore’s DBS Bank has reportedly used to its advantage in driving its own digital transformation in banking. In an industry that has been reshaped by techfins like Amazon and Alibaba, or fintech startups like Square or OnDeck, DBS Bank has responded strongly to earn titles like ‘World’s Best Digital Bank’ (Euromoney, 2018) and ‘Best Bank in the World’ (Global Finance). DBS Bank’s digital transformation starts with a ‘digital to the core’ philosophy that represents an ideological shift from thinking like a bank to thinking like a tech company – the type of move identified in the White Paper: Digital Transformation Imperative as critical to the success of any Digital Transformation Program. This includes flexible IT architecture, automated processes and analytics integration. DBS Bank’s digital transformation program has set the objective of delivering a superior customer experience. One where banking is ‘invisible’ to its customers using smart digital capabilities in most transactions and the customer journeys. DBS Bank has invested significantly in creating customer experience journeys that reflect consumer needs and expectations, leveraging data analytics for contextual marketing and predictive analysis based on historical data. This permits faster query resolution and quick application processes, resulting in customers who are able to more easily integrate their banking with their normal lives. DBS calls this philosophy ‘Live More, Bank Less’. DBS Bank adopted the experience design 4D Model – Discover, Design, Develop, Deliver –to improve its customer journeys, products and services, the type of experience design approach identified in the White Paper: From Satisfaction to Emotionally Connected. The multi-sided platform business models, perfected by Silicon Valley startups and tech firms, enables collaboration to extend beyond a handful of strategic partners to a whole ecosystem of partners. Multi-sided platforms expose firms to exponential improvements in time-to-market for new products & services, and can even benefit the core business’s operations or customer experience. DBS Bank recently launched the largest API platform for 3rd party developers in world banking, with more than 200 API’s across various segments, including loans, deposits, cards and investments. In addition, associations with companies like McDonald’s and Paisabazaar have helped build a strong ecosystem of partners across multiple technologies, enabling an open banking approach that integrates financial services with customers’ day-to-day life and brings joy into banking. Disruptive plays are by their nature risky and can even threaten to cannibalize an organization’s core business. Such plays, though, are becoming increasingly necessary in a rapidly changing digital world. DBS Bank’s strategy in this pillar is ‘pre-empt the disruptors‘ in advanced markets and ‘disrupt the incumbents’ in growth markets. DBS’ boldest disruptive move has been the launch of digibank: India’s first paperless, signatureless, branchless banking app. This revolutionary banking structure offers services like mutual funds and loans and leverages micro-services to drive a better user experience. digibank sees the integration of various smart technologies, including biometrics and an Artificial Intelligence-driven chatbot that handles 80% of customer queries, but it is only one example of DBS’s moves towards disruption. Another is POSB Smart Buddy, the world’s first wearable device for children that facilitates contactless payments in schools. In fact, DBS Bank is solidifying its disruptive innovation experimentation by establishing the DBS Accelerator. The DBS Accelerator hosts cohorts of startup fintech entrepreneurs in an Open Innovation approach. DBS Bank has outperformed in the four areas above, But that success would not have been possible without building the necessary internal capabilities and effectively writing digital into the DNA of the organization. This represents a massive shift in mindset from conventional approaches to digital transformation. In the DBS Bank example, digital disruption and innovation are not campaigns, they are structural, cultural and operational guiding forces of the business. The systemic adoption of digital as a way of being rather than a superficial product development and service delivery layer is what will enable the company to achieve its goal of operating as a ’26 000-person startup.’ Design thinking, agile methodology, data analytics, fintech partnerships, recruitment hackathons, collaborative workforce, underpinned by a rock-solid IT infrastructure to enable it all – DBS Bank understands that, to be digitally mature, you need to integrate employee skills, IT, processes, and culture in a synergistic manner. And the initial results are impressive (See Figure). 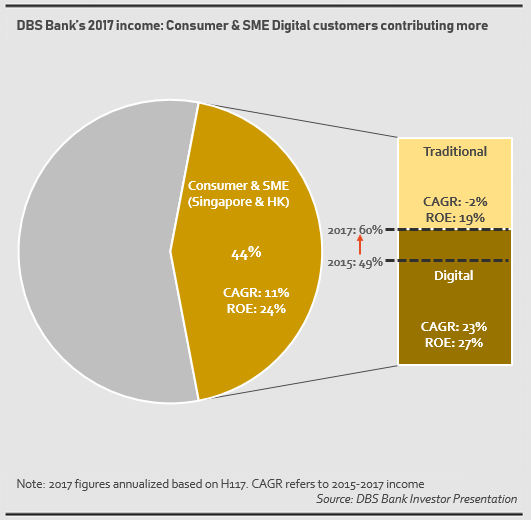 DBS Bank reported earning twice as much in income from its “digital” customers as compared to its “traditional” customers, thanks to its efforts in its digital transformation customer experience pillar. What’s more, the profit from these digital customers is a staggering 3.3x higher that traditional customers, thanks to its digital operations pillar, which improves the cost-to-serve for digital customers. As DBS Bank’s CEO, Pyush Gupta, puts it, “our digital transformation is pervasive, encompassing technology, customer journey and a start-up culture. This is difficult to replicate and creates competitive advantage … We created an end-to-end measurement system which we called the DBS balanced scorecard. It was aligned all the way from the most junior level to the Board.” An Enterprise-wide digital transformation program, coupled with meticulous Strategy Execution Management. DBS Bank’s digital transformation in banking is a space to watch.